Basically, wear whatever you want to physical therapy. The staff are all in scrubs and sneakers, and the experience is far from posh (but so helpful). I like to dress up a bit on PT days, to stay cheery. And I enjoy my time with therapist Vanessa, even though I call her Nurse Ratched. This simple black dress by COS (similar) was thrifted a year ago, and I’ve given it quite a workout. It’s built like a basic box, but I don’t mind forfeiting the waist on occasion. 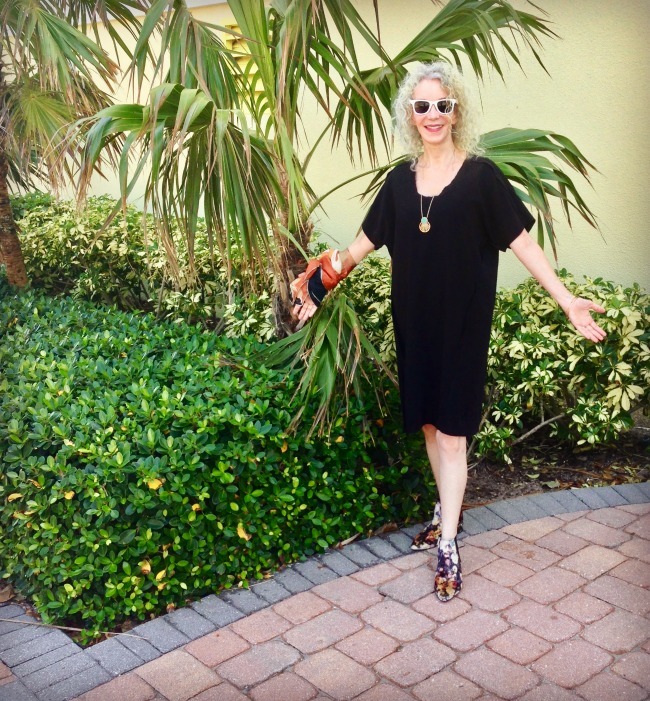 The dress is a great canvas for necklaces and scarves, and it’s machine washable – a beneficial feature because they do messy (but so helpful) things to you in physical therapy! My floral velvet booties (sim) add color, as does the splint-covering scarf (sim). Tie your top: Gail of Is This Mutton looks modern and crisp in this striped ruffle shirt, with bold accessories. Love the leopard print bag and those checked shoes. 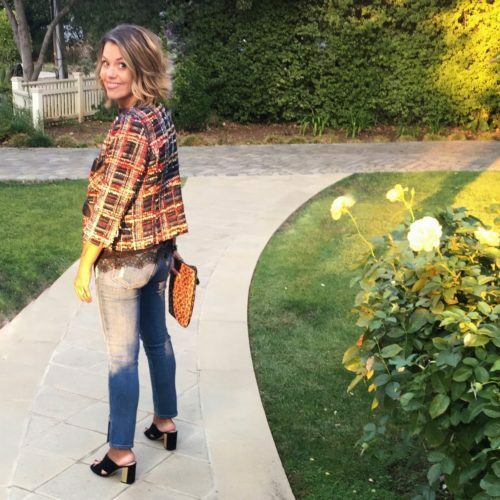 Mix a dressy jacket with your favorite straight jeans: Suzanne of Ask Suzanne Bell combines a classic tweed jacket – in the best Fall colors – with her denim. Check out the animal print clutch and fab block-heel mules. Mix your colors and prints for a one-of-a-kind look: Sacramento of Mis Papelicos put together a duck-print skirt and a feminine pink floral blouse. It’s a magical outfit that captures her vibrant energy. I think you must be the chicest creature ever in physical therapy! Love the blank canvas back dress and beautiful booties. 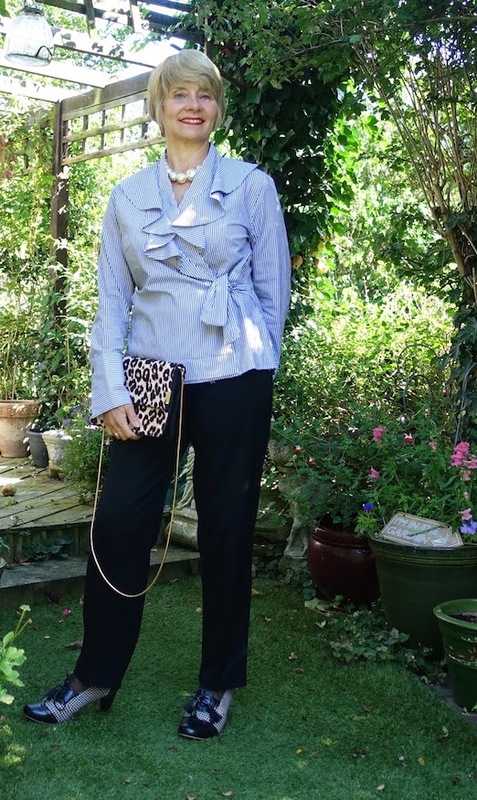 Also love Mis P’s colorful style, and both outfits, one from Suzanne- fabulous way to dress up denim and that great blouse on Gail! I’m new to your blog and love the outfits. I’m guilty of wearing the same thing all the time and need to mix it up! Also, I hope your right hand will be back to normal soon. Will miss you in Seattle Patti! I get not wanting to risk a freshly healed wrist and hope therapy with nurse Rachet continues to go well. You look cute even for therapy! My husband will love that—enjoy every sandwich!! Because it’s true, life is too short!! I do hope the PT isn’t too painful. I’m sure your nurse doesn’t mind that nickname one bit! ; ) That movie was so disturbing! The boots really make that outfit. Who knew that floral velvet booties could be so versatile? Those boots are fantastic! Hope your PT is going well. Did your Dr recommend? I wish mine had when I broke my foot last year. My left leg hasn’t been the same since! You can say that again! I’ve been to an orthopedic doctor up here in NE and he told me that’s definitely what I need to do. Love the whole look. The dress shape has been one of my faves since Balenciaga showed it first. The boots are so special. And I really LOVE the scarf on your arm. Really. Stunning.